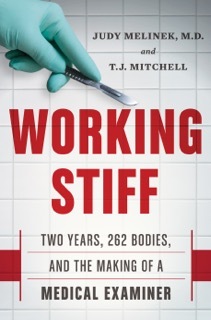 Released last year, Working Stiff: Two Years, 262 Bodies and the Making of a Medical Examiner by Judy Melinek, M.D. and T.J. Mitchell is one of the most riveting, darkly humorous and moving memoirs I’ve ever read. I rated it *****/5 stars and placed it on my 10 Best Nonfiction Books of 2014 list. It details the two-year medical examiner residency in New York City for Dr. Judy Melinek. Dr. Melinek started her medical examiner training two months before the terrorist attacks on 9/11. It’s engrossing, detailed and macabre. Dr. Melinek wrote it with her writer husband T.J. Mitchell. The two met while undergraduate students at Harvard. There are chapters detailing poisons, accidental deaths, suicides, murders, maggots and bugs [“Stinks and Bones”] and the somber process of identifying bodies [and body parts] after 9/11. I’ve worked in healthcare and almost changed careers to become a nurse. I’ve worked in all types of settings with patients from babies to the elderly. The medical world and pathology intrigue me. 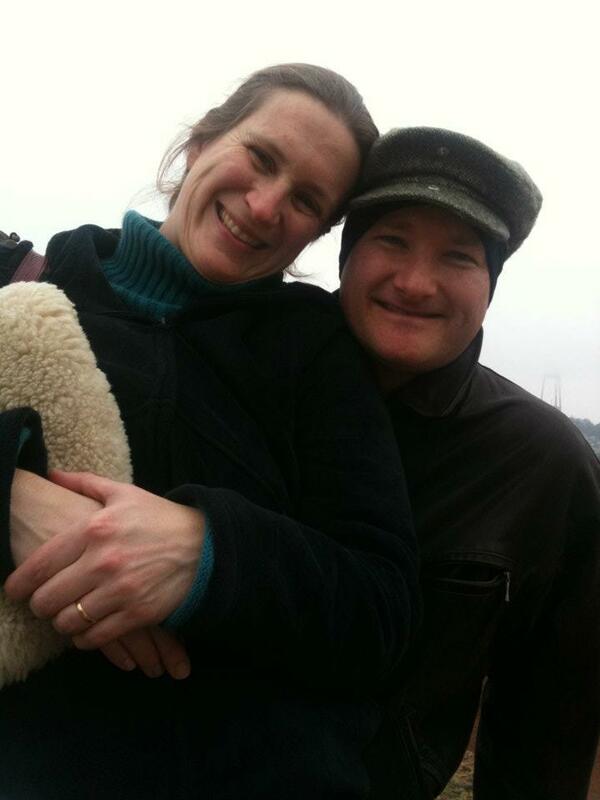 After meeting Dr. Melinek through twitter, she and her husband T.J. answered a whole bunch of questions I sent their way. And disappointingly skipped my more pressing questions about poisons and suicide. I sent a lot of questions and said it was okay to skip some. Disappointed that questions on poison, alcoholism, suicide were skipped. also this one: you are “less comfortable with houseflies, and leery of cats.” Please explain. Also this one: description of people jumping from the World Trade Center is the only account like that I’ve read. Well done. What was the greatest challenge of DM01? How did you handle it? Guess I’ll just have to do more googling or hope that one day I can interview Atul Gawande, M.D. Amy Steele: I was riveted by this book. There are lots of books about medical students. Particularly first-year residents. How do you think yours stands out? Judy Melinek: When I was in medical school I read them all – House of God by Samuel Shem, all of Perri Klass’ books, Oliver Sachs—these books inspired me as a physician and an author. They made me realize that in writing about my experiences I could keep my humanity intact, and by reflecting on the joys and tragedies, I became a better, more empathic doctor. Working Stiff fits the doctor-memoir genre, but it stands out in some ways because of the singular experience I had in New York City during a historically turbulent period: 9/11, the anthrax attacks, the crash of American Airlines #587 in Queens. Most forensic pathologists in the United States might deal with one major terrorist threat or disaster in their lifetimes. During my fellowship year, the New York City OCME faced several. Working Stiff is also unique in that it focuses on the training of a medical examiner, instead of on celebrity deaths or who-dunnit cold cases. Since T.J. and I opened the story at the very beginning of my forensic training, we could take the reader along as I learned death investigation from Dr. Hirsch and the staff at the New York OCME. Amy Steele: Did TJ ever NOT want to hear one of your gory days on the job? The other source of frustration for me in listening to Judy talk about her day at work was that she seldom delved into the things I wanted to know about. Where did this happen? What became of the perpetrators? How did the cops feel about the whole thing? Her focus is the story the body tells about the cause and manner of death, period. Plus, as we quote her telling me in the book, she’s a busy lady. She has new cases every day, and doesn’t spend time lurking around the homicide division or the DA’s office gossiping about open cases. Still and all—I wanted to hear them. I just can’t help myself. They’re compelling, the stories my wife tells over the dinner table. I had a ball writing Working Stiff. Amy Steele: You’re in the minority with couples where the husband stays at home with the children. So yay to feminist advances for one. What challenges do you face? How do others react? T.J. Mitchell: Things have changed since I first started as a stay-at-home dad fifteen years ago. I used to have to explain to people what that meant. Now there are plenty of SAHDs out there—and some very talented and funny bloggers and authors have written about the job’s challenges. I found those challenges to be minor, really—or, I guess it’s more accurate to say, the unique challenges were minor. All parents face the same obstacles, and the ones I faced as a man that a woman wouldn’t face were easily overcome. Usually they had to do with persuading well-meaning older women that I really did know what I was doing, alone with a baby or three. A lot of that unsolicited advice involved hats, and whether they should be on or off, and whether they were too warm or not warm enough for the weather. For the past ten years I’ve also been extremely fortunate to be a stay-at-home dad in the city of San Francisco. I started to notice soon after moving here that nobody ever asked me that irritating question I had to field on playgrounds and in grocery stores in Los Angeles and New York most every day: “Is it mommy’s day off?” That’s because, in San Francisco, a man with a baby or three might not have a mommy involved in the family equation. The very question would entail a faux pas. So I, as a straight man in a parenting role that reverses the normative gender expectations, am a beneficiary of the gay civil rights movement. My biggest worry never materialized. I feared, early on, that our kids would either spend all day pining after their absent mother, or fail to bond with her in the same intimate way that kids who spend all day with mommy would. Neither of these things happened. Judy Melinek: It doesn’t make us extra cautious. It makes us realistic and appropriately cautious. We subscribe to raising independent “free-range” children. We don’t stress out about giving our children the freedom to bike or walk to school alone, or take public transit across town, because we know that they are safer walking and riding the bus than they are being driven in a car. We freely discuss the effects and dangers of drugs and alcohol, and we don’t shy away from talking about death or suicide. They are entering their teen years, and open discussion with your kids about these serious topics allows them the freedom and comfort to trust you with their own struggles, or when they encounter a friend or classmate who needs help. T.J. Mitchell: Plus, when Judy tells our kids or one of their friends, “Don’t do that! I know someone who died that way,” they listen. She has gold-standard street cred when it comes to safety. Amy Steele: I’ll admit to you I DO NOT wear a seat belt even though six years ago I flipped my car on black ice. Right over. I wasn’t wearing a seatbelt. I crawled out the broken window. Judy Melinek: That is a really dangerous and bad idea. It also has financial consequences for you and your family because if you were going to get injured or killed in an accident, your injuries might be determined to be your own fault because you were not using the safety equipment as required by law. Wearing a seatbelt is a habit, and, like any habit, if you just build it into your routine, clicking it in place as soon as you get into the vehicle, then you will stop even thinking about it. Once you get used to it, if you then forget to put it on, you will see that you start to feel uncomfortable—like you are going to fly out the window even at a brief stop. Amy Steele: What are the leading causes of death you see? Judy Melinek: Heart disease is the leading cause of death in the United States and often kills people suddenly, through heart attacks and strokes. I find that it is not uncommon for folks to ignore the signs of a heart attack (chest pain, shortness of breath, arm pain) or stroke (dizziness, numbness/tingling, partial paralysis) because the pain is not that severe and they don’t actually feel all that bad. By delaying medical attention they are much more likely to die. It’s really important that all men and women over the age of 40 familiarize themselves with the symptoms of heart attack and stroke and seek immediate medical care. Every day at the Coroner’s Office we have one or two cases of overdoses, either from prescription drugs, street drugs, or alcohol. A really common way for addicts to die is when they get out of rehab and relapse, they take the same quantity of drugs that they took in the past, but because they have lost their tolerance, they end up dead. In my opinion, it should be mandatory for rehab centers to educate them about that on discharge and provide them with reversal agents. Amy Steele: How did you decide what stories to tell in the memoir? When writing did you have a gross-out level in mind. Some readers are clearly more squeamish than others. T.J. Mitchell: At first I was concerned about the gross-out level, but very quickly I found that I just had to tell Judy’s story the way she lived it. If we tried to tone down the more macabre elements of that life we wouldn’t be telling the truth, and telling the truth is the first requirement of narrative nonfiction. We decided which stories to tell based on the requirements of narrative nonfiction, too—the narrative part. We wanted to use stories that advanced the story and illustrated the science, while holding the reader’s attention. Our collaborative process served us well when it came to the more complex case studies. We worked as a team to make sure the science was solid and the storytelling was straightforward and engaging. Amy Steele: How do you determine time of death? Judy Melinek: Time of death is very tricky and depends more on the scene and circumstances than on hard science. We ask when the person was last seen alive and we figure out when they were found dead, and in all cases they died sometime between then. It’s not rocket science. Sure, things like body temperature, rigidity (stiffening of the body after death), lividity (pooling of blood after death) and decomposition can be used in some cases to narrow down a time interval, but none of these methods is scientifically foolproof, and all are highly dependent on the ambient temperature. It always cracks me up whenever the pathologist on CSI or Law & Order definitively says, “She died between 9 and 9:30 PM.” A half hour window? It’s more likely for me to say to the real-world cops I work with, “Based on the body temperature she likely died sometime between 9 PM and midnight, but it could be more or less, and don’t quote me on that or write it down because I don’t want to have to defend that in court.” Too wishy-washy for a TV drama, but that’s the way it is in reality. Amy Steele: What is the strangest cause of death you found? What’s the weirdest thing you’ve found when you’ve opened someone up on the table? Judy Melinek: I always get asked those questions and I don’t know what to say. “Strange” and “weird” are relative, and while in Working Stiff I describe the piercings and tattoos that initially took me aback when I found them hidden under decedent’s clothing where the sun don’t shine, these things don’t faze me any more. Sean takes the bet. Dead Guy drops his drawers. He collects his money. Amy Steele: You said: “I always will wait until I’ve removed the brain before I dissect the neck, because by then all the blood from the skull and face will have drained out leaving a clear view of the long, flat strap muscles on the front of the throat.” How did you develop your process—by doing or are you taught a specific protocol? Judy Melinek: Training. At the New York City OCME I was given a checklist and body diagram and taught how to fill it out as I examined the body both externally and internally. The check list keeps me on task and reminds me to check all surfaces, and by following the same protocol on every single case I don’t miss anything. The checklist and diagram have changed a bit over the years, with different headings and check boxes based on the individual agency I work for, but it has a front and back outline drawing of a human body with room for me to draw in any injuries, medical devices or findings. Protocols are important in every specialty of medical practice, forensic pathology included. Amy Steele: Besides examining dead bodies on the scene, what must MEs look for at a site? Judy Melinek: It’s different in every case. When I get to a scene, the first thing I do—before I go in, even—is talk to the family members or witnesses, or the police officer at the scene, to hear the story or stories of what happened. How was the body found? Who found him? What is his medical history? If it’s a homicide, then generally I have to wait for the crime scene unit to photograph the scene before I can even go in. Amy Steele: You’re now a forensic pathologist. How did your ME training prepare you for your current career? Judy Melinek: The training I went through at the New York City OCME [Office of Chief Medical Examiner] really prepared me for the basic day-to-day challenges of doing autopsies, communicating with cops and family members, and testifying in court. What it didn’t prepare me for was the working world of political pressure, internal squabbles, and petty bureaucracy. That I learned on the job when I moved on, because as fellows at the OCME we were well insulated from all that nonsense. Today I work as a forensic pathologist at the Alameda County Sheriff Coroner’s Bureau, and I also testify as an expert witness in legal cases as an independent consultant. I find that, like in many professions, keeping in touch with colleagues in my field via e mail and professional conferences has been then best way to stay up to date and to learn how to handle the ethical and political challenges of a career in a high-profile public role. Amy Steele: Congratulations on selling the rights to the memoir and developing a TV series. How will First Cut be similar and different from the book and similar to your own experiences? T.J. Mitchell: The TV deal you refer to is for Working Stiff. First Cut is something else, a work in progress right now. It’s our next book together, this time a novel. First Cut is smart forensic detective fiction, with a protagonist based loosely on Judy, and with cases taken from her own experiences—taken from, but not reproducing exactly. The story traverses the familiar territory of the noir mystery novel, but with a uniquely heightened degree of verisimilitude that derives from Judy’s real work in death investigation both inside and outside the autopsy suite. We’re collaborating again as we did in Working Stiff, and are having a lot of fun writing First Cut. Amy Steele: Thank you for taking the time to answer my questions. This entry was posted on January 28, 2015, 19:55 and is filed under Books, Interview, Women/ feminism. You can follow any responses to this entry through RSS 2.0. Both comments and pings are currently closed.